Claim "Skye Bank. 708/709, Adeola Hopewell Street, Victoria Island, Lagos"
Do you think SkyeBank employees are nice? Rate and write your review today! 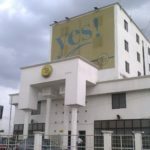 Skye Bank Plc is a product of the merger of five legacy banks as a result of the banking industry consolidation and recapitalization exercise of 2005. The legacy banks were Prudent Bank Plc, EIB International Plc, Bond Bank Limited, Reliance Bank Limited and Co-operative Bank Plc. Following the merger and the seamless integration of the disparate resources, personnel, IT infrastructure, culture and procedures, the bank has since grown into a formidable financial institution showing strong growth and profitability and providing unique financial solutions to a wide customer base both in Nigeria and in the three West African subsidiaries of Sierra Leone, Gambia and Guinea. In 2014, in our continuous quest to provide better customer experience, Skye Bank won the bid to acquire the 100 per cent ownership stake of Asset Management Corporation of Nigeria (AMCON) in Mainstreet Bank Limited, a deal which made Skye Bank one of the top four banks in Nigeria. Mainstreet Bank’s operations has since been integrated into the bank’s operations in one of the smoothest and hitch free integration process recorded in the Nigerian banking industry, enabling it to offer banking services to a wider segment of the Nigerian population and with significant positive impact on the bank’s balance sheet, financial performance and profitability.